Mitochondrial dna testing, usually abbreviated to mtDNA testing, is becoming more common but doesn't have quite the same clout in genealogical terms as Y-dna testing. Nonetheless, it is gaining in popularity, and can be used to clarify the genetic backgrounds of female ancestors. 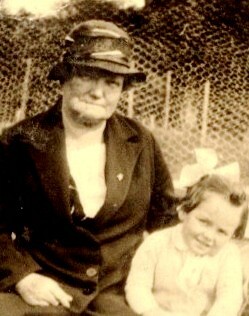 My mother shares her mtDNA with Granny Doyle and all the women in her direct maternal ancestral line. She also shares it with all of her children, but only the daughters can pass it on to the next generation. What is a mitochondrial dna test? Mitochondrial dna is passed from a woman to her children. Unlike Y-dna, which examines the y-chromosone and is passed only from male to male, mtDNA is passed to daughters and sons. So a mitochondrial dna test can be taken by both men and women. It is important to remember, however, that while men have mtDNA, they cannot pass it on. Only women can do so. Mitochondrial dna testing involves analysing specific 'markers' along the strand of DNA. These markers can then be compared with another individual's markers. Distant relations, who shared a common ancestor perhaps several hundred years ago, will have mt-DNA that is very similar. Just how similar will depend on how many of their markers match. The more markers that are similar, the closer the relationship. Why isn't mtDNA testing as useful as Y-dna to genealogy research? Y-DNA, being passed and retained down the male line, historically runs in parallel with surnames. Through analysis it is possible to group men with the same surname who share certain dna 'markers' and to say with certainty that they are related. The same is not true for mtDNA analysis because women have, historically, changed their name on marriage, so the surname link has been lost in the female line. Surnames studies are gaining in popularity, and, as more people add their dna to the databases, they are becoming increasingly useful to the genealogy researcher. In the family tree below, Anne's mtDNA is represented by the bright pink colour. She passes it to her son, Mick, and her daughter, Kate, but it is only on Kate's line that it goes any further. Each time Anne's mtDNA is passed to a male, it comes to a halt. So Mick's children have the mtDNA of his partner, Betty, and his grandchildren have mtDNA from two other women. 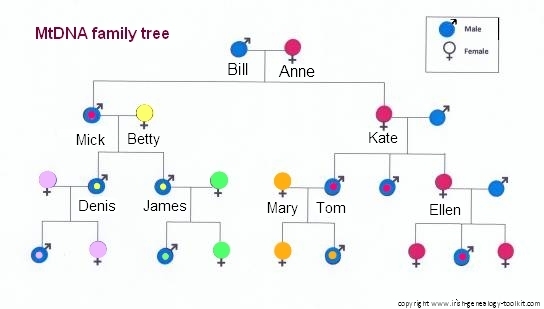 On the female line, however, Kate's mtDNA is inherited by all her children, but is only passed on to the next generation via her daughter, who in turn passes it to all her children; it will only be passed on to the next generation if one or both of her daughters have children. There's more about this below, in the text box entitled Just one part of the equation. What is the genealogical value of a mitochondrial dna test? It is 'mutations' in dna that provide the distinct markers that separate blood relationships. Unlike Y-dna, mtDNA mutates only slowly over many generations, so analysis simply doesn't provide sufficient clear evidence of distinct, relatively small, family groups. What evidence it does provide is sufficient to identify certain key characteristics of relatively large family groups. For this latter reason, mitochondrial dna testing is referred to as 'deep ancestry' analysis. Haplogroups are groups of people who share similar DNA. For example, if mitochondrial dna testing shows that an individual belongs to haplogroup H, it means their ancestors went northwards from Africa many thousands of years ago. Some 40%+ of modern Europeans are in this haplogroup. If the test showed haplogroup L1, the individual shares their genetic make up with people from west and central sub-Saharan Africa whose ancestors have lived in that region for more than 100,000 years. The theory is that we are all descended from one woman who lived in Africa at least 100,000 years ago. She's been named Eve. Her descendents spread out from their original home; while some moved to different parts of Africa, others moved to the Middle East (60,000 years ago). Some of these moved to Australasia, some to East Asia and some, eventually, made their way to Europe (the last 15,000 years) or crossed a land bridge from Siberia to the Americas. Down the thousands of years, mutations took place in the mtDNA of these ancestors, and these mutations spread with their respective group. Over time, particular mtDNA mutation types became associated with certain groups and the areas they had moved into. MtDNA mutates only every 20,000 years or so on average. Over time, these mutations make up a large number of potential variables, but each individual can be placed into one of less than 40 distinctive types called haplogroups. Deep ancestry tests don't tell you exactly which ancient people you are descended from. They can tell you only where people with close matches to your DNA are found in today's world. But this provides a clue as to where your distant ancestors might have come from. Mitochondrial dna testing does not, theen, tell you a lot in genealogical terms but it does help to put your ancestry into context. DNA testing for ancestry: how to order your home dna tests. How to order your home dna tests. See main Genealogy DNA Testing page. Every person on earth has one mother, two grandmothers, four great grandmothers, eight great great grandmothers, and so on. However, each individual's mtDNA comes only from their direct female line - from their mother, their mother's mother, their mother's grandmother, and so on. So, while Anne in the diagram below left is a perfectly valid great grandmother to each of her nine great grandchildren, only three of her great grandchildren have her mtDNA. The other six carry mtDNA from three other women to whom Anne is not related. Mitochondrial dna testing of Mary and Tom's daughter would show that her mtDNA is from her mother, Mary, who is not a blood relative of Anne's. Anne has contributed to the girl's genetic make-up in other ways; she would have passed on some autosomal (atDNA), but not mtDNA. MtDNA testing, like Y-dna testing, is an analysis of ONE line of a person's genetic ancestry.